Well, I guess its more like, what’s gonna be on my needles?? The plan for July is this…legwarmers for my daughter. This summer, she is going to 3 weeks of dance programs. I love these, Hyde Park Legwarmers, by @Sweatshopof Love. I don’t think my daughter will find any other ballerinas with those! Also, a baby blanket for my son’s track coach. Welcome to the World, baby Mac. I am going to knit the baby blanket found in the July Issue of Creative Knitting. Thanks @BevKnits! Hmmmm, what else? I just joined #12Socks Twitalong, a new Twitter Knitalong….I’m joining (so far) @KnittyorNice, @TreeHuggersWife and @VTKnitboy. The goal: 12 pairs of socks over the next year starting today! Who else is going to join us? This month, I am going to finish a pair of socks that I started for my son this past April. And lastly, I hope to tackle something for me! Do you know I have never finished anything for me? I have a beautiful handbag that needs felting and lining but I think I got an overdose of felting last December. Hopefully, by the time the kids go back to school, I can get that done…right now, I seem to have been bitten by the What Can I do Around the House Bug? Nothing major: swapping the guestroom with my daughter’s bedroom, changing some light fixtures, cleaning the basement and some closets and a little gardening. But I digress… for me, I will be knitting The Loop Entrelac Tank Top also by Allyson of The Sweatshop of Love. I have wanted to learn Entrelac for a while and this is such a pretty summer sweater. Currently, I am almost done with the Cotton Bamboo Smock Top Twitalong. Binding off the main part and working on the sleeves/straps tonight. This turned out to be a very easy sweater to knit…perfect for watching TV. 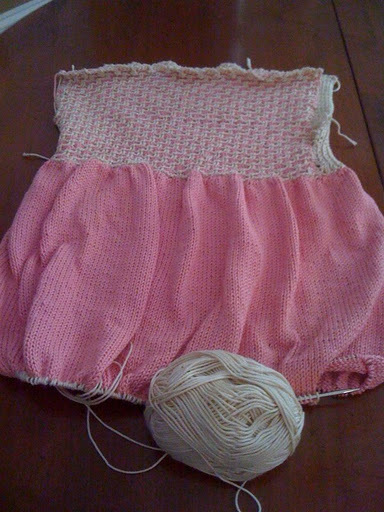 I think all of us in the Twitalong used Knit Picks Shine Sport Yarn …I used blush and cream. I never knitted much with cotton and was a little hesitant to do so. I was afraid ,since it was cotton, it would separate but it never did. It’s very soft and, I think, has a nice look. Can’t wait to see more pics of @Jbee42’s and @Cheekytarts’s Twitalong Smock Tops….they were both using some pretty green colors.